Looking for the perfect mountain lodge? Black Bear Lodge is perfect combination of recreation and relaxation. Surronded by US Forestry Service Land and in the heart of the Aska Adventure Area, you will be minutes from the Toccoa River for tubing, canoeing, fishing as well as minutes to hiking and waterfall trails. The cabins views will make you feel as though you're tucked right into the mountain side, with blue and green vistas sprawling out in front of the cabin. 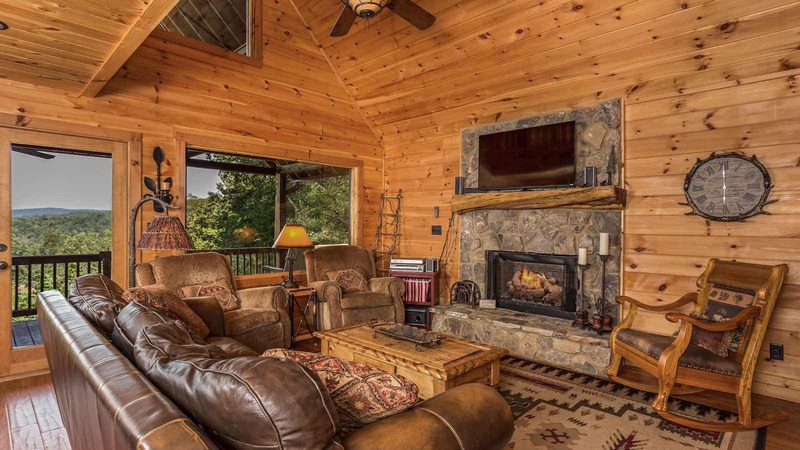 The wrap around main level deck is great for entertaining guests, having breakfast at the small log-style bar, or the outdoor fireplace with rocking chairs. The rocked entry way opens up to the main level to the kitchen with a stone front breakfast bar, granite countertops, and 6 person dining table. The breakfast bar offers 4 whisky barrel & iron stools for additional seating. The lovely kitchen and dining area flows into the living room. This cozy space is the ideal spot for lounging on the leather sofas, as a unique cedar log mantle compliments the stone gas log fire place and shelves the flat screen television. Watch a movie, have a cup of hot chocolate, enjoy your own wine & cheese tray (Downtown Blue Ridge offers many interesting wines and cheeses to sample!) or maybe just take in the mountains from all the windows the main level offers. The main level bedroom is decorated with upscale western style furniture, including an antique reclaimed saddle, a hand carved barnwood king bed, an ornately carved armoire, and vintage cowboy boots. The tile shower adjoining this bedroom is also decorated with western style accents; antler adored mirrors, log slab counter top, and double vanity wash basins. 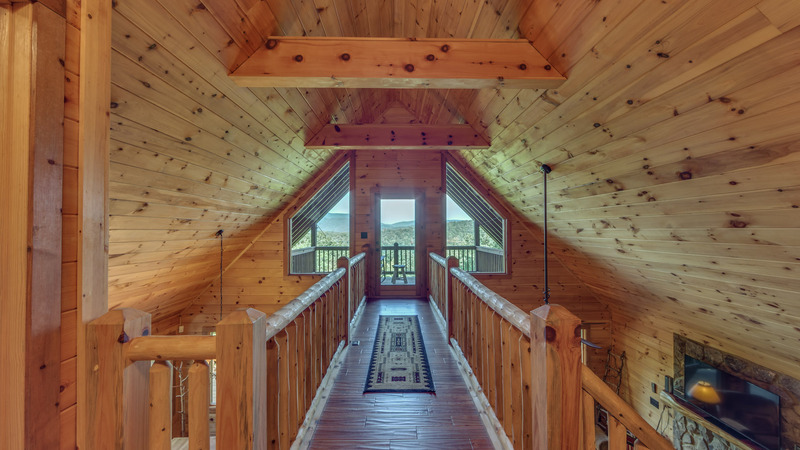 Venture up the round log staircase on reclaimed log slabs for steps to a unique feature: a skywall from the upper bedrooms and bathroom to a balcony with rocking chairs for a birds eye view of the unblemished mountains. 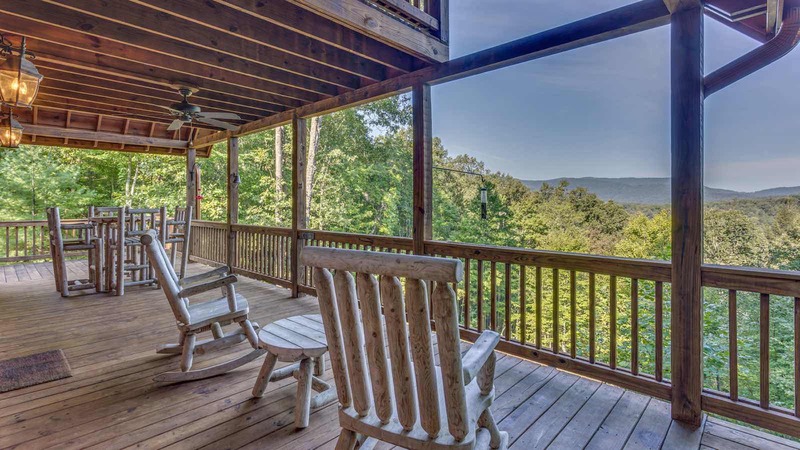 Imagine witnessing the local wildlife on the grounds below from the rocking chairs, endless star-gazing, or just listening to the sound of rain on the tin roof above on this delightful balcony. This level will have two separate bedrooms each with its on flat screen television. One bedroom has two twin log beds with a TV and the other bedroom a king log bed and TV. Just a step from either of these bedrooms is a separate full bath, which has double vanities on a log slab and another tiled shower. Ready for a game of pool or a dip in the hot tub? Take the stairs to the finished basement level, where you'll find an awesome pool table, another gas log fireplace, sofa & chair, the fourth bedroom, and another tile shower. This bedroom has two round log bunk beds, so a total of 4 twin beds are in this room. The separate bathroom is just past the bedroom on this level, with the third tile shower as well as the third log slab counter top with double vanities. In the game room, the gas log fireplace is topped with another cedar mantle and flat screen television. 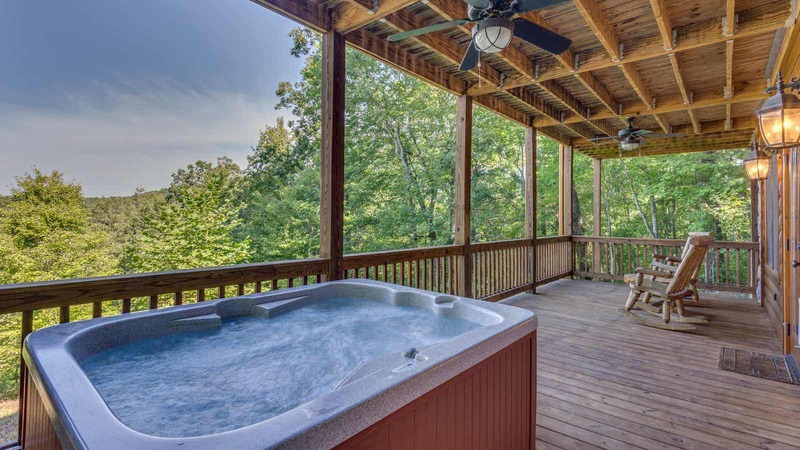 Open one of the glass doors to the hot tub and take in the mountains as the bubbling tub and steam soak your cares away. With these amenites and space, Black Bear Lodge is perfect for a girls or guys trip, family vacations, or group trips to the mountains!